I wouldnt normally blog a wall visit, but thought folk might be interested in a report on the new harrogate Wall. Me, dave shield, Sweary Ian and Andy T went to the new Harrogate Wall on thursday to check it out. If you are on the north west side of york its much quicker than leeds – about 25 minutes. If you are on the south east, like me, its no quicker as you have the cross town traffic to contend with. Nice wall though. First thoughts: "oh dear, these grades seem quite stiff" Rapidly replaced by " not too stiff at all, once you get used to the route style". Certainly much more consistent than oaklands. Its a decent size and height, good use of space. I think the best aspect of it is the interesting variety of wall angles – some technical slabs with overlaps, to a roof route that got much swearage out of Ian, some tufas, lots of variants on off-vertical to overhanging. Much more 3D in style than either the oaklands or leeds walls. There has also been some clever use of the wall to provide jamming and layback cracks – take tape if you fancy the jamming crack coz at present the friction is very rough indeed. There is a small Outside outlet there too, but its not very big,and no cafe yet – just a few refreshments available over the counter. ps when you sign up they make you demonstrate tying "a knot that you would use to tie in". This feels strangely difficult to do when the rope is not actually attached to your harness! Another pre-dawn start – but this time it wasn't for winter climbing, but for the final leg of the RAB Mini mountain marathon series in the Peak District. Or so we thought. It was snowing hard as we drove down the M1, and the message arrived – the event was cancelled as the approach roads were impassable. Luckily, we had the climbing kit in the car (just in case there was time for anything after the run), so our objective changed and we headed for Edale. The rest of the drive provided the crux of the day, the roads were so icy it took us a good 3 hours of slipping and sliding to get to Castleton. We parked and headed for Mam Tor, hoping the previous night's hard frost had done it's magic. It hadn't, and despite plenty of ice and snow, the ground was completely unfrozen. Not ones to let such things put us off we headed up the gully anyway. Mostly easy going, until it got steeper near the top and I was climbing what felt like vertical gravel. A sudden attack of sanity just below the top, where it really did become vertical, and I traversed left to avoid the most suicidal section. I was soon at the trig point, which provided the only protection on the route. Grade II/III but ungradable in the today's conditions! Atmospheric though and full of history, worth going back for when properly frozen. A short walk along the ridge led us in a mile or so to Back Tor. This is much shorter, but also much more like proper climbing, having things like solid rock, and turf that doesn't disintegrate when you touch it. We climbed Back Tor Gully, another II/III – just one pitch, but fun, and with some properly frozen turf and even quite a bit of old hard snow. Not quite what we'd planned, but a fine day out. We were staying at the Ochils MC hut in Crianlarich – an old favourite, especially now the mice have gone! The good conditions meant a big turn out for all three nights of the extended weekend. Nigel and Clare set off from York well before the crack of dawn on Thursday, so had time to bag Ben Challum when they arrived. The rest of us appeared in drabs and drabs until well into the early hours. On Friday, Carmen, Clare and I headed for Beinn an Dothaidh with the intention of climbing Taxus (III 3 ***) with the possibility of taking in the Icefall Finish (IV 4) if I was feeling brave enough. A not-quite-early-enough start saw us leave the car park shortly after 8am, just after another group of 3. A route march up the hill saw us overtake 2 other pairs, but the other team got there first. Several other teams could be seen approaching in the distance. Obviously lots of people had the same idea of getting this popular route done on the Friday, before the crowds descended at the weekend! A couple of short ice pitches alternated with snow, and it wasn't long before we were at the decision point, where the normal finish turned left up more snow, while the grade 4 alternative carried straight on up nice looking blue ice. The decision was easy – the normal finish would have been a bit of an anti climax, and the ice was just too inviting to ignore. It turned out much easier than expected, and a couple of short pitches saw us with just one pitch left, presumably relatively straightforward. Of course this turned out to be the crux, up steep and a very exposed wall with just enough ice for some well-placed hooks, but not enough for protection! We topped out into glorious sunshine at about 3pm, so had enough time to take in the summit and follow the SE ridge before descending to the col and back to the car. Rob and Will also did the same route, but started an hour later – which meant they spent much of the day queuing at belays. 🙁 The last pitch had been beaten to death by the time they arrived, all the ice was gone leaving rock with a little battered turf, so probably a bit harder than earlier – as well as darker, as the sun was about to set! Due to Rob Soupmeister's late finish we went without a starter for the evening meal, but Carmen's veg curry and Mr Sainsbury's fruit pies and custard meant no-one went too hungry! The next day, Nigel continued his Munro quest with an ascent of Beinn Chabhair. 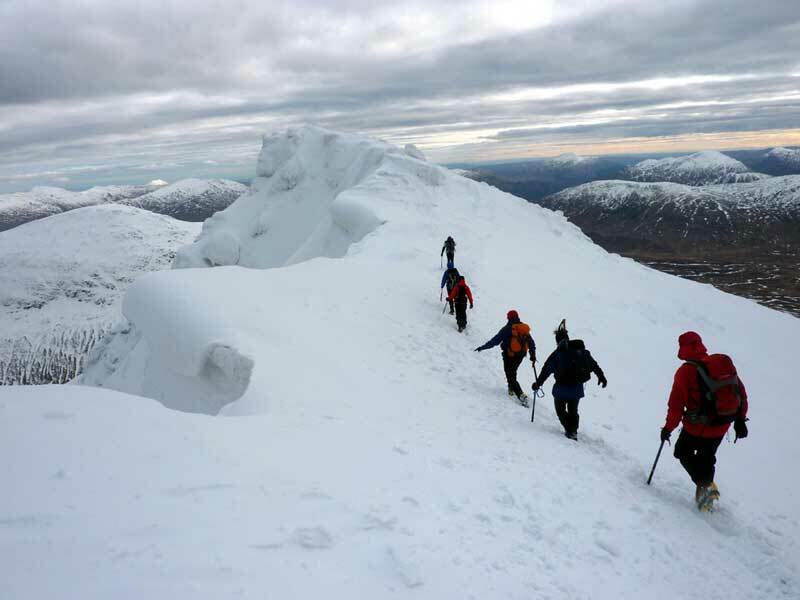 Most of the others did a traverse of the Ben Lui hills starting in Glen Lochy and taking in Beinn a' Cleidh, Ben Lui, Ben Oss and Beinn Dubhchraig. Rivers had to be forded to begin and end the day, which finished well after dark. Rob, Will, Carmen and I returned to Beinn an Dothaidh to climb whatever didn't have a queue! Of course the place was practically deserted, even Taxus – obviously everyone had done it the day before! Will and Rob went for West Buttress (III 4 ***), a mixed route in 5 pitches, while Carmen and I took a fancy to Cirrus (IV 4 ***), up a narrow chimney/gully to the right, despite the guidebook referring to its difficulty in thin conditions. 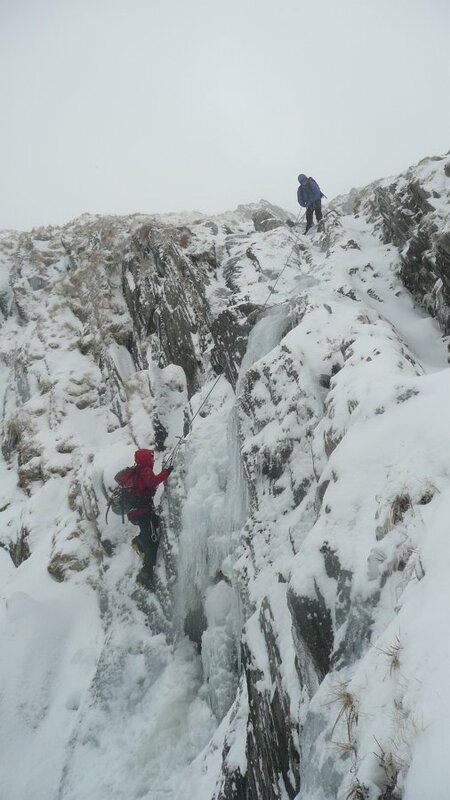 The ice on the first pitch, a steep chimney, was certainly thin! I faffed for ages trying to work out how to get up, eventually leaving my rucksack in the cave at the bottom, wriggling up the back of the chimney to place a nice ice screw in fat ice, before traversing back to the light and thrutching/back-and-footing up the chimney with a couple of axe hooks round fragile looking icicles, with a final swing into the upper groove and welcome thick ice and snow. The second pitch was up a splendid looking icefall, which started up a narrow undercut ice ramp – good ice for the axes, but very little for the feet, and off-balance until a hidden ledge appeared on the right allowing a bridging exit. The last pitch looked much easier, but wasn't. After some more faffing trying to set up a better belay and retreating to the original, I led up steep cruddy snow and ice into the upper gully, and eventually emerged at the top, completely exhausted. It had taken us something like 6 hours for a 135m route! One step too far for me out of my comfort zone, it was all a bit too worrying (though with a few days hindsight for the bad bits to fade from memory I've now begun to have enjoyed it!). To make up for the night before, Rob made 2 soups, followed by Peri's splendid sweetcorn and bean gunk with chilli sauce (sorry Peri you'll have to make it again) and then the traditional cake and custard from Mr S.
A thaw was forecast on Sunday afternoon, so Will, Rob, Peri, Carmen and I were up at 6am. Rob was so surprised at this, that he went back to bed for half an hour. The destination was the fabled icefalls of Beinn Udlaidh, which we were assured were up there somewhere in the clag. Just one pair in front of us, and of course they headed directly for the route we'd planned on doing, West Gully (III *). So a bit of faffery later we switched to White Caterpillar (III *), which starts in the same place but head left up an icy ramp. A fine route it was too. Will and Rob went first, heading up the direct variant (IV 4) as it looked too inviting to ignore. Peri was going to head right on the original version, but the gully was not in condition, so I led through up the direct instead. The thaw had well and truly arrived by now, and the icicles were all dripping, but the ice quality was improved by the slightly milder temperatures. Steep but well protected climbing up superb ice, well worth it. Unfortunately this was followed by steep cruddy snow, and a traverse left with good axe placements but feet slipping all over the place – Peri bravely led this without placing any protection! No time for anything else, a quick descent and some hut-tidying and we were off home. Meanwhile, after a couple of false starts – forgetting gaiters, and parking in the wrong place – Tom, Fliss and Nick climbed Ben Vorlich – the Loch Lomond one. The top was covered in mist, and it looked very like many other Scottish Mountains – white with a few rocks lying around. Inattention meant that they came down the wrong valley from the summit, sounds familiar. This month's 'Sunday activity' was a walk in Wharfedale, taking in Buckden Pike and Great Whernside. The forecast was a bit iffy, but 7 hardy souls made their way to Kettlewell for a 9.30 start. Nigel and Alan had brought ice axes, how bizarre we all thought, you don't need axes in the Dales. The cloud was low, as were the temperatures, with the ground frozen hard. We walked along the Dales Way to Starbotton, where we slogged up a bridleway before a long traverse to the old lead mines below the summit. The path by this stage was largely covered by snow. A spot of second breakfast/first lunch was followed by a stuff pull up to the summit of Buckden Pike, where the usual bogs were all snow-covered and/or frozen solid. The snow level by the walls was mostly wall-high, rendering stiles unnecessary. Nobody much fancied the wimps option of a direct descent from Tor Mere Top back to Kettlewell, so we all continued to the road below Great Whernside for second lunch. Annie won the prize for her array of salad, crab paste, and stilton choose, among many other things. The summit (where Annie did a back flip off the top of the cairn, 0/10 for style) was followed by a steep descent with varying degrees of control, Peter's bum-slide being eventually stopped when he left the snow and met the grass. A good day, the weather better than it could have been (the rain started as we drove off), and the unusual chance of seeing a Dales avalanche site! More of our photos here and Peter's here. … and then we were 8 brave souls heading for a hut with no leccy, no gas, potentially no water, a 10 min walk in uphill and temperatures predicted to be minus a few overnight! After some frantic lift sorting we met up in Betws pub (after a burger stop at the OK diner) just in time to meet Simon and Carmen returning from the hut (oops). The Wessex Club's hut is in the woods above ByC and parking is in the hotel car park with a reasonable path leading to the small but well formed hut in the process of renovation. With only 8 of us we had plenty of space but a few people were ruing their choice of sleeping bags! Bright and early passed, then we got up and all made out way to the Pass (D via Joe Browns at Capel open at 8.30am) and the long trudge up to Clogwyn y Ddysgl above Cyrn Las. A slog with some awkward bits – still not sure the easiest route up there. Hoards of people were headed up Parsley Fern Gully (I,***) but S+C and Clare and I geared up for Sinister Gully (III, 4 but very soft) with another team just ahead of us. We all soloed up to the crux a short 10m or so ice fall and a queue. Simon went first followed by Carmen, and I followed failing to get any screws in but feeling ok on the reasonable ice. Clare followed easily enough. 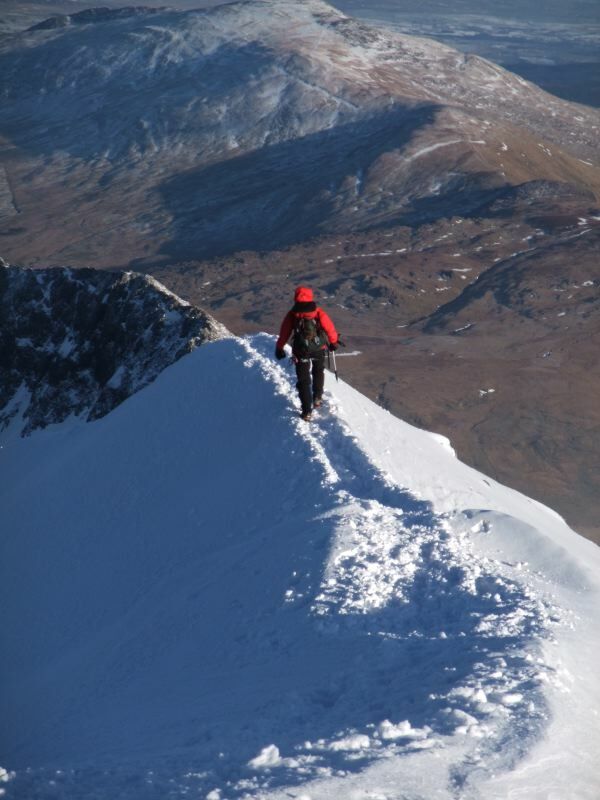 We then pitched out the next two pitches of snow slope and a bit of soloing up perfect never to join S&C on the Cryb-y-Ddysgl ridge in glorious sunshine. 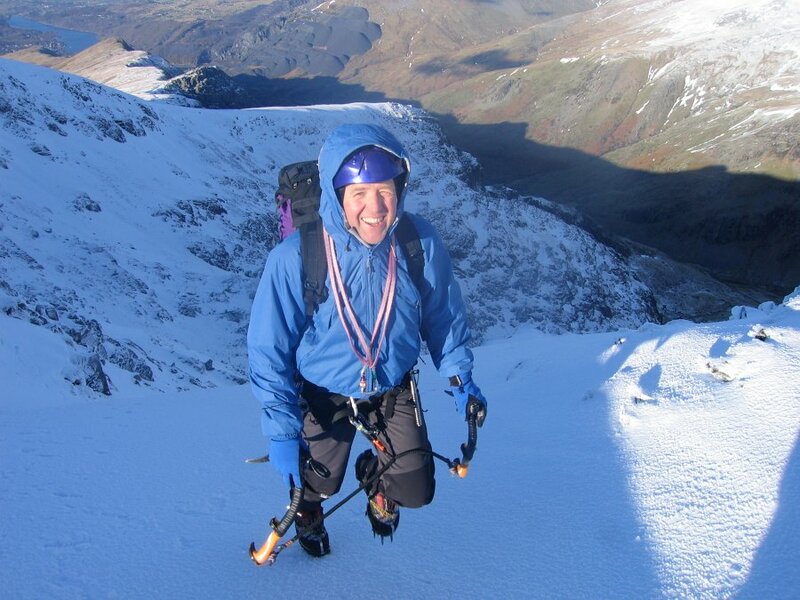 Ticking the trig point in honour of Charles we traversed back across Crib Goch – fantastic views, light and solitude. The descent down to the path to Pen y Pass proved awkward and the walk out longer than I remember, but we were rewarded with a huge red moon. Soon we were pub-bound after some cunning hitching from Simon to retrieve the car. In the pub we met the others and Matt who dropped in but turned down the offer of a freezing bunk. They had enjoyed a similarly great day out on PFG, Liz tackling the left branch (II **) before heading to Snowdon summit and descent down the PYG track and a bus back to the car. Fantastic day out for all. Sunday was more overcast and S,C and I headed for Clogwyn Du above Idwal slabs and the big team went for a little walk (having rejected Bristley Ridge due to conditions). Turned out a tad further than anticipated but rewarded with good views and a good stretch of the legs. Meanwhile we had flogged our way up into Cwm Cneifion with hundreds of other people. Our initial plan was Hidden Gully (II **) but we spied a frozen stream that led that way. I led the main pitch – well most of it, some it fell down. I managed to get a few comedy ice screws, including highlights of a stubby tied-off screw in rubbish ice, and one which was still in the ice when the ices fell off! Felt quite exciting at about III,3. A few little play steps led us into the upper Cwm and Clogwyn Du, where we headed up Easy Route before branching right up Hidden Gully. Some excellent funky ice on a lovely but way-too-short route. We headed down Easy Routeb (I *) and home – past Tower Slabs that look an excellent playground worth exploring at about III. 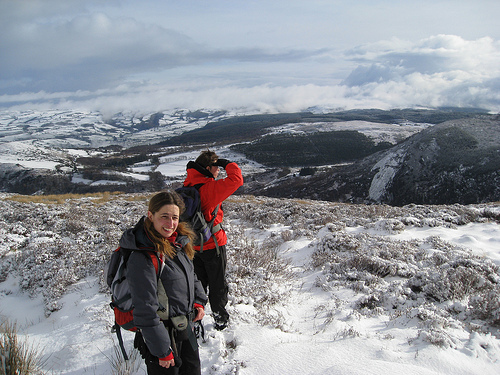 You are currently browsing the York Alpine Club Blog blog archives for February, 2010.